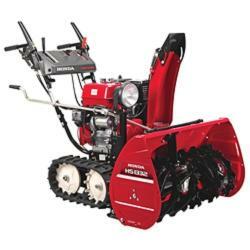 If you are looking for an efficient, high quality snowblower, look no further than Honda. Their products are the most durable and long-lasting models on the market and are perfect for getting rid of any snow that is blocking the path to your house, sidewalk and driveway. No matter how big the job, Honda can offer the best snowblower to put your mind at ease. Honda offers two different types of snowblowers: single stage and dual stage. Single stage snowblowers quickly and quietly pick up snow and shoot it out of its chute with the help of semi self-propelled auger drives. Single stage snowblowers are smaller and easier to maneuver than dual stage snowblowers and have a 20” wide clearing width that is 12” high. They can move up to 55 tons of snow per hour. Dual stage snowblowers are larger and perfect for clearing a wider path with a 24″ clearing width and 20″ clearing height. They are self-propelled and are known for removing a larger and deeper amount of snow than a single stage snowblower at an incredibly faster pace. The dual stage snowblowers also have serrated icebreaking augers that easily break up ice or snow that is crusty or hard packed. Dual stage snowblowers can move up to 50 tons of snow per hour. 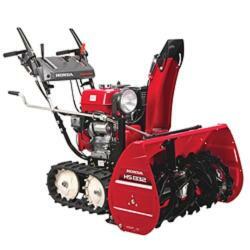 Honda makes snowblowers with engines that feature a commercial grade hydrostatic drive. Their snowblowers have sturdy bronze gear on the chute rotation rod, heavy metal chutes and auger housings. This is combined with ball bearings that help support the steel auger gear drive. Since all of Honda’s tires are low-pressure, you don’t have to worry about tire chains. Track drive can help you get rid of heavy duty snow in the worst conditions. This type of snowblower can help you remove snow on steep inclines, pathways with steps and other uneven surfaces. Track drives are slip resistant and give you greater control of where to direct the machine. Since there’s less chance you’ll slip and slide on the ice due to its powerful traction, this is the best option for serious and icy weather. Wheel drive was created for less serious snow conditions. If you don’t think you will use your snowblower frequently, you should add a fuel stabilizer to the fuel storage container. This prevents your snowblower’s fuel from deteriorating before you use it again. It’s recommended that you fill the fuel tank up completely, since any air trapped inside the tank will cause the gas to deteriorate faster. Gasoline should never be left in your snow blower for more than 90 days if it hasn’t been used. So if you think you won’t use your machine for more than a couple of months you should drain all of its gas completely from the fuel tank. Look at your Honda owner’s manual to get detailed step-by-step instructions on the proper way to drain your snowblower. How Do You Start a Snowblower? Recoil snow blowers require you to pull a rope to start the machine, while electric machines have a 120-volt push button start. You will need an extension cord to initially power the electric machine, but you can remove the cord after the snowblower is powered on. 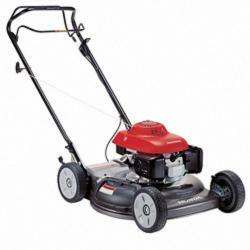 All electric start snowblowers have a recoil start for back up. Certain snowblowers come with controls that can be adjusted to vary speed and performance. Their hydrostatic transmission allows these models to be especially very user friendly and easy to operate. Can I buy Honda Snowblower Accessories? Yes! You can buy skid shoes to help prevent skidding on extremely rough surfaces. Polyester snowblower covers can protect your machine from wear and tear when it’s not being used. An attachable cab can help shelter you from the cold winter winds and keep you warm. Also, if you own a HS724 snowblower model you can buy an attachable work light accessory. Lastly, if you live in an area that has very heavy snow you can buy the drift breaker kit accessory. For accessories and replacement parts, go to www.hondalawnparts.com. There is an easy online parts lookup diagram and ordering online is easy. Honda prides themselves on creating highly durable products. Honda vehicles are fuel efficient and run quietly in any atmosphere. They have top of the line fuel economy and lower emissions than other products that are on the market.